Get your hands dirty while helping out the community! 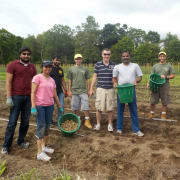 Community Harvest Project (CHP) is working to build an engaged and healthier community by bringing volunteers together to grow fresh fruits and vegetables for hunger relief. CHP is the largest non-governmental source of fresh produce for hunger relief in Worcester County. More information on CHP is listed below. CHP gives everyone a chance to experience the value of agriculture and a new respect for fruits and veggies! Our volunteers work outside, rain or shine, since hunger doesn’t stop because it’s raining. This specialized volunteer crew role will support our Grafton or Harvard farming operations in a variety of capacities and reports to the Farm Manager. Tasks will vary throughout the year but may include groundskeeping support, farm project implementation, and some equipment operation. No prior farming or equipment experience is required, but relevant skills are desired and beneficial. Training will be provided as appropriate for specialized tasks and equipment. This is a hands-on role that will often involve hard, physical work, including heavy lifting in sometimes adverse weather conditions throughout the year. This crew will partner with farm staff to assist in stewarding the Grafton and Harvard farm properties on Tuesday mornings weekly. One day per week, approximately 3 hours from February through November.